This adventure was one more on Sweetie’s “first time” list. The cool thing is that this was also a first time adventure for me and Wife as well. On a recent warm Chicago Sunday afternoon we were craving a sweet treat. 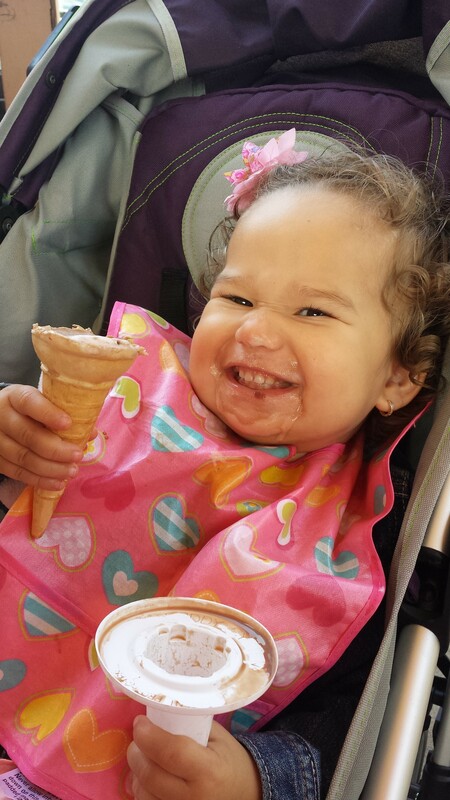 So we loaded los abuelos into the ride and we went to Rainbow Cone for some ice cream. 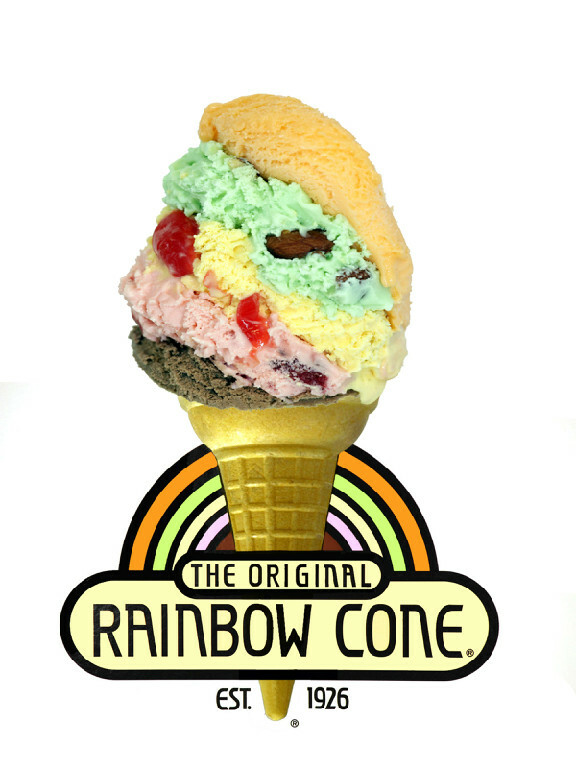 Those of you familiar with Rainbow Cone know that “A Rainbow Cone” is not just “some” ice cream, but more like an ice cream sculpture. For those who have not yet had the pleasure, that’s 5 flavors of ice cream piled on to one cone in a particular order: chocolate, strawberry, Palmer House (New York vanilla with cherries and walnuts), and pistachio topped off with orange sherbet. This cone is one of those things that sounds bizarre but tastes just right. I personally would not order most of those ice cream flavors by themselves, but together they form a powerful treat perfect for battling hot weather. It’s kind of like ice cream Voltron. 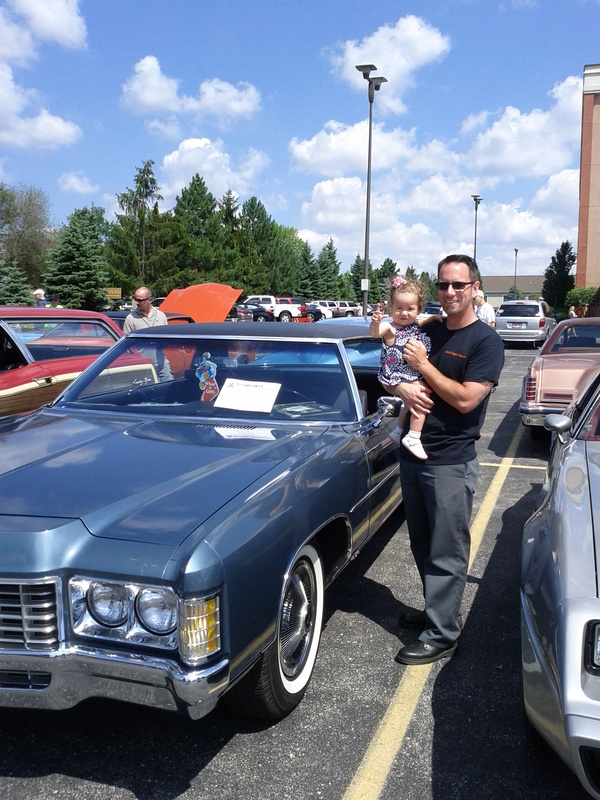 Everyone enjoyed their cones, but of course Sweetie stole the show. Just to be clear, she does not eat ice cream with any frequency and this was a special occasion. 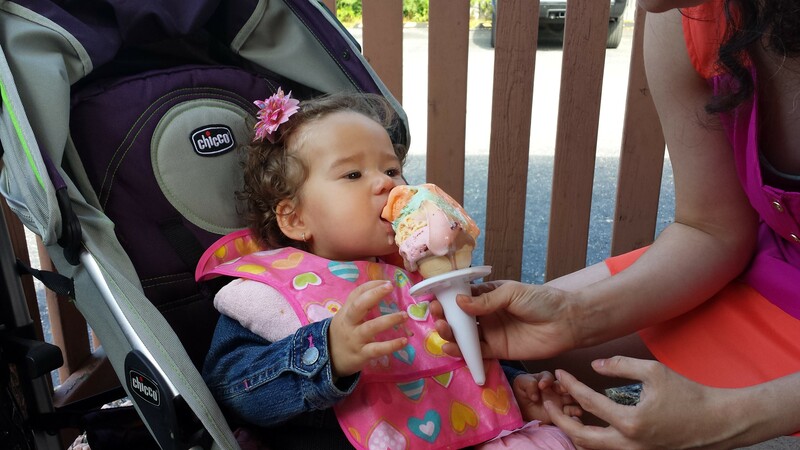 Even without that disclaimer, I think the pictures of Sweetie slaying her cone cancel any criticism I earn for giving my daughter ice cream. I don’t care who you are, these pictures are great. 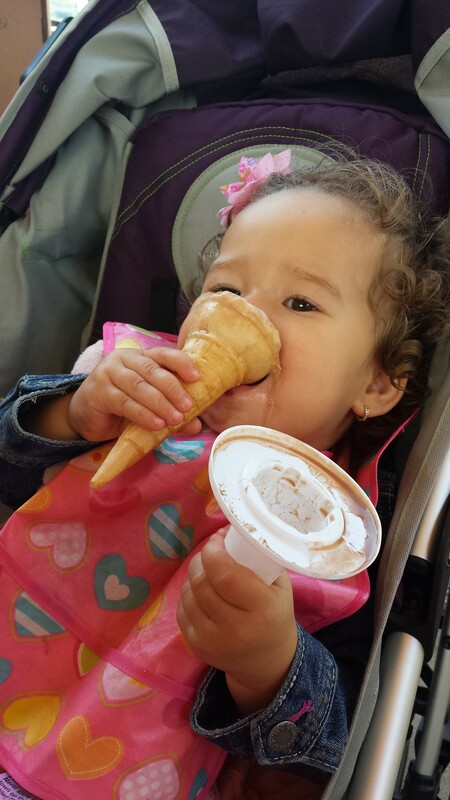 And I don’t know that “enjoyment” really captures how much my daughter liked the Rainbow Cone. I should say a special thank you to Wife, who was nice enough to share her cone with her daughter (unlike most days of the week, I didn’t have to). Located at 92nd and Western, Rainbow Cone is close enough for an afternoon visit, but thankfully not close enough to enjoy regularly. Needless to say, los padrinos want to go for a cone so that means a return visit. Yet one more reason to love Chicago! I don’t normally say this; especially on days with missed naps, poop-splosions, and toy tornadoes. And bragging is not usually my style. But today was different. And today you wish you were me. Today you were probably stuck in an office, working the day away. But today was around 75 degrees with a lake breeze, mostly sunny and beautiful. So today we went on an adventure downtown. Big Daddy B, Momma Z, Linda, Sweetie and I piled in the ride and headed to the heart of the city. 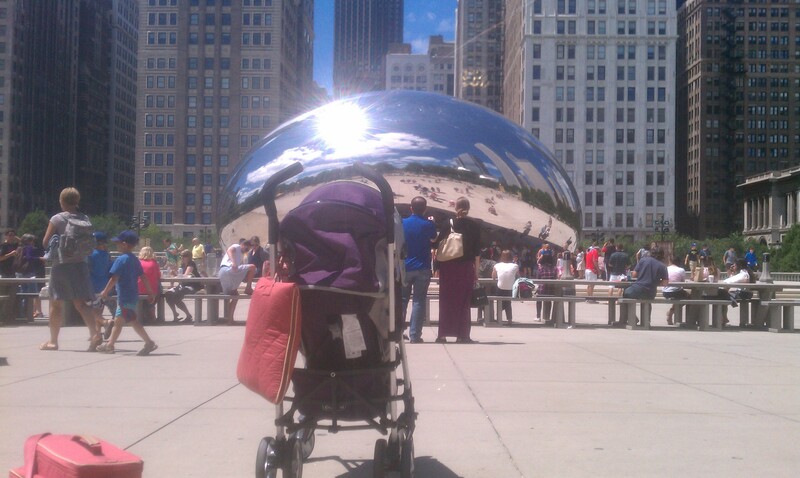 The adventure started down at Millennium Park with a music class for the girls. It was an English version of the class they take at the Old Town School of Folk Music. There is a giant tent set up there with music classes, book readings, arts and crafts, giant checkers and giant tinker toys. Overall the activities are for older children but the girls had a blast and definitely got down. After music class we scoped out a spot for lunch. While we were hunting around we noticed the Chicago Symphony Orchestra warming up in the Pritzker Pavilion. They were getting ready to practice for the night’s concert. 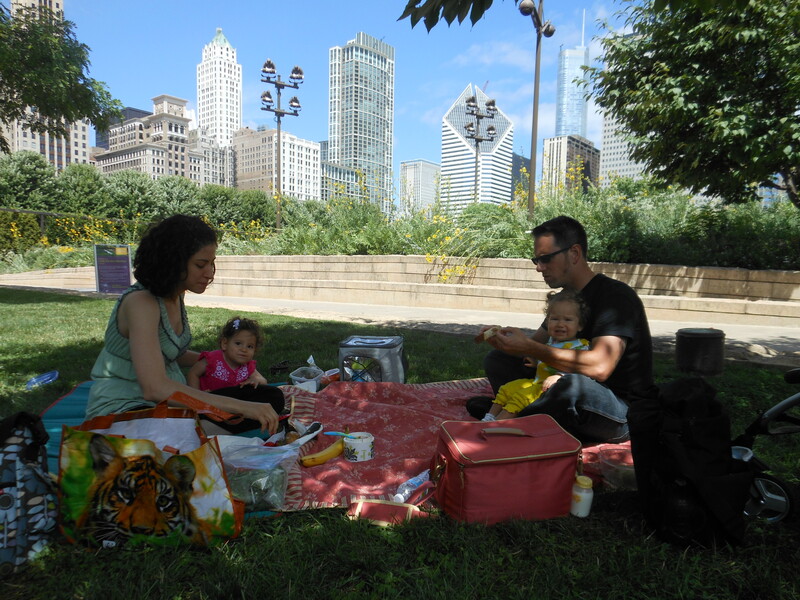 So we found a great spot on the south side of the park among some shade trees and sat to enjoy our picnic lunch. All the while the symphony played in the background. 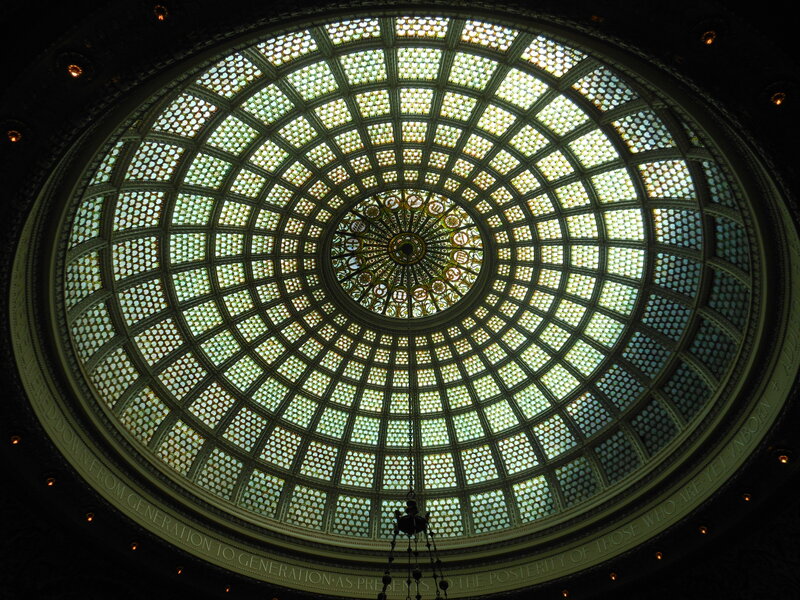 Next stop was the Chicago Cultural Center, just a short walk across the street and we wandered in to explore. The girls both fell asleep after lunch so the adults could do as we pleased. As always, the Tiffany Dome was impressive to see. We also caught two art exhibits; the first was Modernism’s Messengers: the Art of Alfonso and Margaret Iannellitone. They were a couple who worked together on various marketing and architectural projects. Many of the works were designed, built and displayed in Chicago. The second exhibit was by Stefan Sagmeister, called The Happy Show. It focused on the topic of happiness, explored through selected entries from the artist’s journal. The Happy Show was a particularly good find that we stumbled on. It was wonderfully bizarre but got you thinking. We wrapped up at a perfect time in the middle of the afternoon. For treats we hit Dunkin’ Donuts for a road coffee before hopping back in the ride. Traffic was clear heading north so we ended the day on a good note with an easy cruise home. 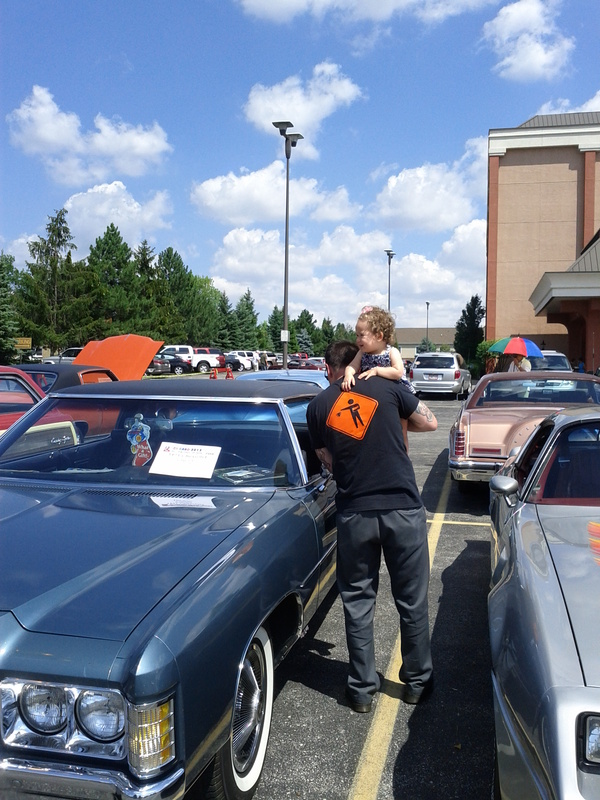 Today was a great day in Chicago; a great day on the detour. So yeah, today you wish you were me. Now I hope you can go and have such a day so you can write the same back to me.